If you don't like writing, you are in distinguished company. This past weekend, I read a most interesting comment from Peggy Noonan, who writes a weekly column for the Wall Street Journal and used to write speeches for Ronald Reagan. To say the least, she is very gifted at her craft and recognized as such by some of the best in the game. Yet, she writes this in her column. "Writing is never pleasurable, at least for any one sane...". I really like to write, and am curious what she means by this. For me, writing is a creative process that lets me get my head around an idea in a way that talking about it, or listening to it, never will. Rather than consuming an idea undigested in some vaguely understandable form, writing about it allows me to turn an idea over in my mind from many angles, and figure out how I am going to understand it. I enjoy that. Maybe I'm not aware of it, but perhaps I am just not sane. I have a pretty unique opportunity going right now in one my test plots. The plot has a fairly decent run of Zythia going, at the same time one of the test materials is causing a slight burn on the leaves (it's an unregistered oil), so we have the chance to compare the two. Those of you have called me concerning Zythia know that I look for the little brown to black spots representing fruiting bodies (thank you Steven Koike!) in the centers of the necrotic areas caused by the fungus to confirm it. Usually there are concentric rings of growth also, and while these aren't diagnostic they for sure point out that symptom in question is being caused by a living organism. Contrast that with phytotoxic burn of the leaves and other plant parts. No fruiting bodies for sure, nor any rings of growth. 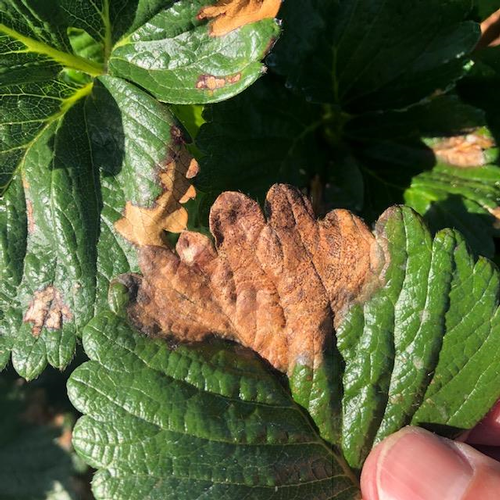 Too, if one is familiar with how spray droplets disperse on the leaves, it should be a small matter to trace back areas of burn to where water would gather. Veins, edges of leaves and low spots on the foliage are common. Let's go to the pictures to make my point, shall we? View from the top, distinct areas of tan colored burns distributed around the most exposed leaves. Spray burn close up. 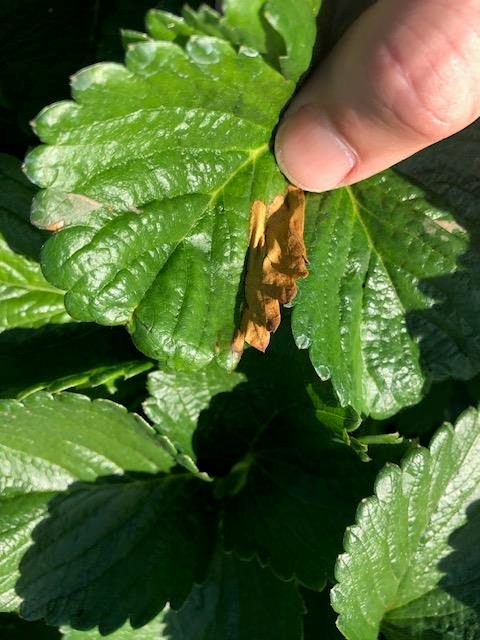 Distinct tan area at leaf edge. 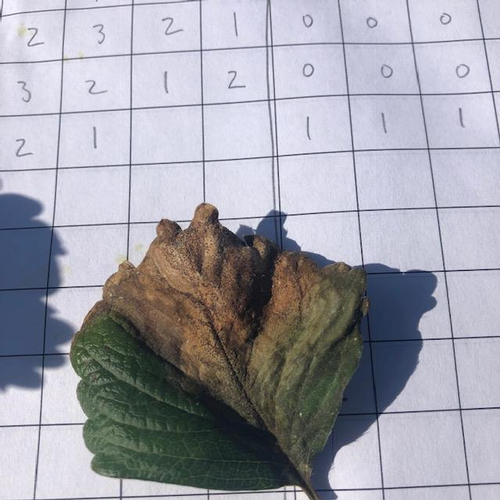 Leaf severly infected with Zythia fungus. Note the abundance of dark colored fruiting bodies towards the center of the spot. Comparing phyto burn (leaf on the left) with Zythia (leaf on the right). Challenge question. Which one is the phyto? Spoiler alert - the answer is now in the comments below. 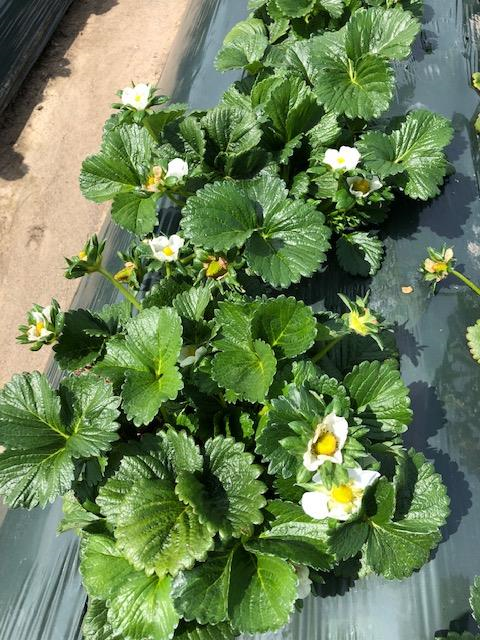 Sure enough, just a few days of real summer weather and the strawberry plants are pushing out some seriously high quality fruit. 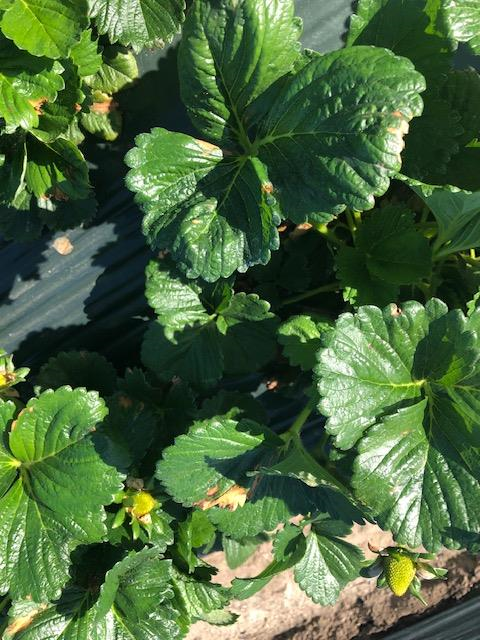 There's a lot of messed up ones yet in the field that came to fruition during the rains of the past few weeks, but once those are cleared out and all the new ones come in we are up for some big harvests of nice fruit. Found this beautiful number in my KPAM crop termination plot. 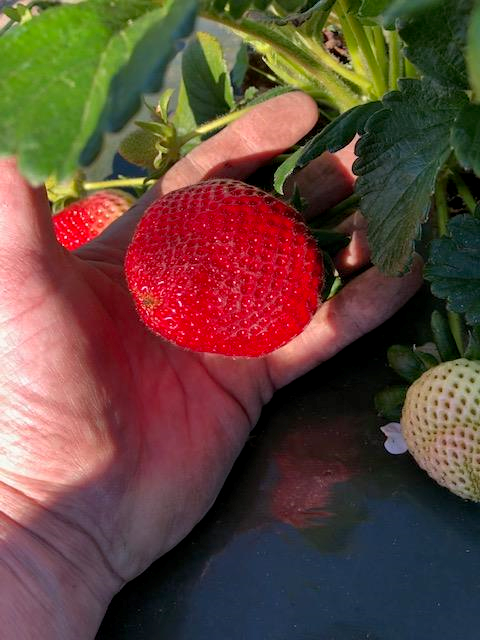 San Andreas variety, almost as big as my hand, easily tops 50 g.
While it's pretty common for Californians to set aside their complaints about rainy weather because we need the water, the flip side for the Central Coast strawberry industry is ruined fruit and plant problems. I've been seeing a number of fields with the problem of Photo 1 below. 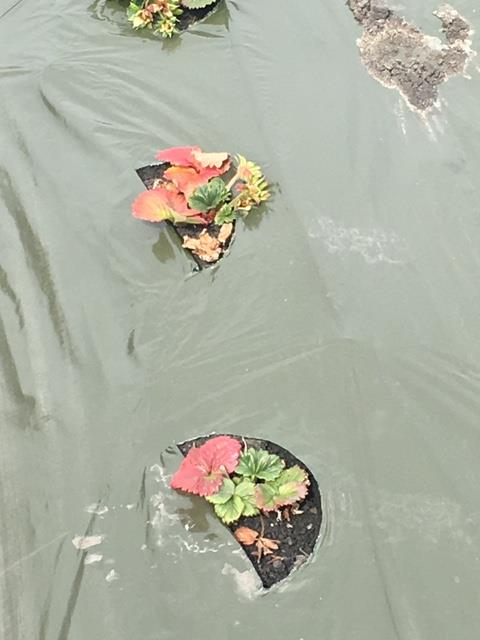 Plants are barely growing, the foliage is discolored and the overall aspect is not great. It's best to take a careful, step by step approach to these problems. 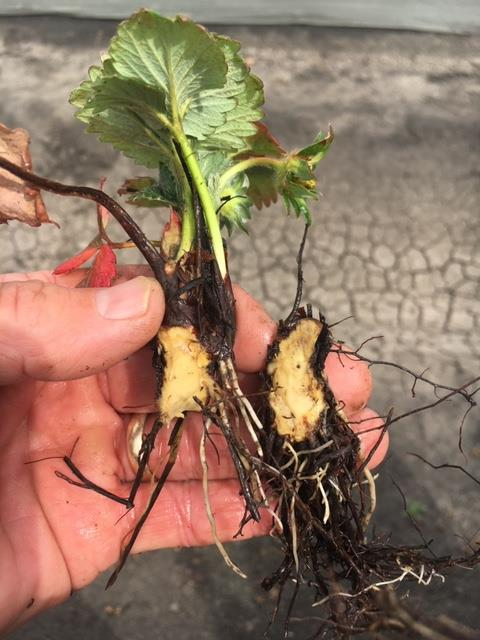 Splitting open a crown of one of the plants from the field shown in the first photo shows no discoloration common to many soil diseases (and in this case diagnostic testing confirmed that). 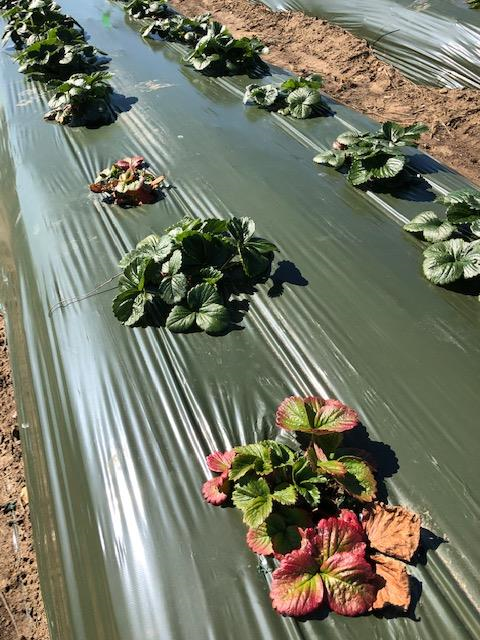 The discoloration of the foliage is consistent with a lack of nutrition, but that plants very close to the ones doing poorly are doing great belies the idea that the field as a whole is lacking. Let's look at the soil of surrounding these plants for a moment. There is a lot of water associated with these areas (close observers of Photo 2 below, and I know there are many since they want to figure out whose field this is, will see that there has been standing water indicated by the cracked soil) engendered by being a bit lower than the other part of the field, or being on the heavier side of soil type. Other areas, which are not as low or not as heavy, not nearly as many sick plants, if any at all. How then does one explain the lack of growth and more so the mineral deficiencies so evident in the leaves? Easy. 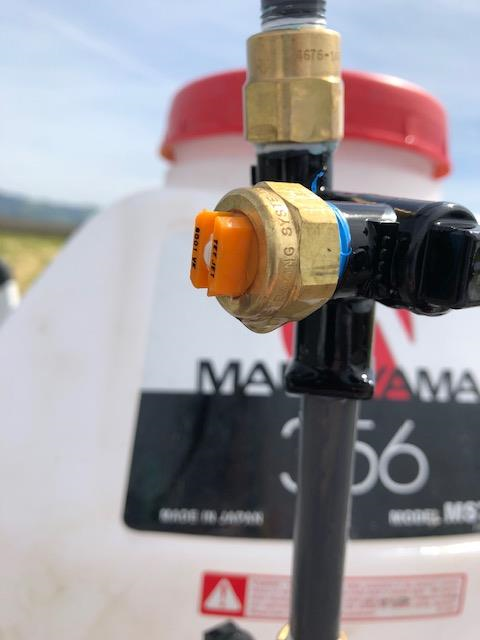 An excess of water around the plant roots create a near, if not completely, anaerobic condition and interfere with the processes needed to take up minerals from the surrounding soil which in turn impede growth. With the above steps completed, I'd feel pretty confident on making the call that this is water related. So much in fact that I'm writing a blog about it. To be sure, disease is out there as evidenced by the third and last photo. These plants are very similar to the others, although the spotty pattern in the field gives one the sense that it's not excess moisture. Splitting open the crown revealed discoloration, and further testing at the diagnostic laboratory confirmed Fusarium. Photo 1: Aspect of plants in affected area. 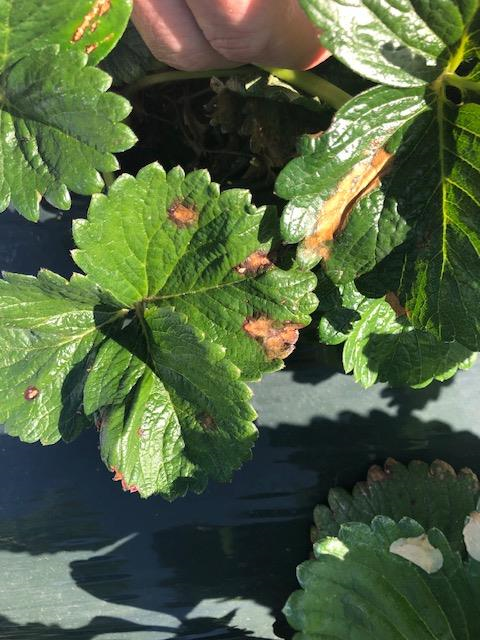 Discolored, small and struggling to grow. Photo 2: Crown split open on affected plant. No discoloration, also note how very little the roots have grown over the three months or so since planting. Photo 3: Looks like the same deal as above, but these were confirmed as Fusarium. You'll be hearing more about these soon I am sure.